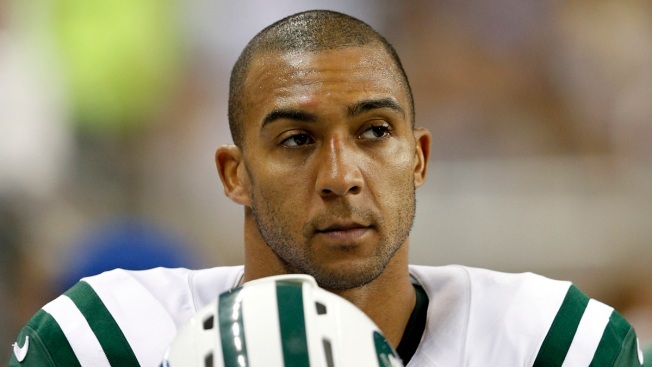 Kellen Winslow will be eligible to return to the Jets' active roster on Nov. 4. Jets tight end Kellen Winslow Jr. was suspended without pay for four games by the NFL on Friday for violating the league's policy on performance enhancing substances. Winslow, the team's leading receiver with 17 catches, will immediately begin his suspension, meaning he will sit out the Jets' game against the Pittsburgh Steelers on Sunday. He will be eligible to return to the Jets' active roster on Nov. 4, following New York's game against New Orleans on Nov. 3. The Jets have a bye-week break after they play the Saints, so Winslow's next opportunity to play would be on Nov. 17 at Buffalo. Winslow had been listed as doubtful on the Jets' injury report on Friday, and coach Rex Ryan excused him from participating in practice but declined to go into details. "I'd rather not get into it," Ryan said. "I excused him. I'll just say that." The 30-year-old Winslow, in his first year with the Jets, has been dealing with a balky right knee all season that kept him out of practice all week. He hasn't missed any games, though, and had two touchdown catches, including one in the Jet's 30-28 victory at Atlanta on Monday night. But he didn't speak to reporters after the win, and uncharacteristically chose to not speak in the locker room after practice all week. That led to speculation that perhaps he was unhappy with his role in the offense. Last season, Winslow played in just one game with New England before asking to be released because he anticipated a lack of playing time behind Rob Gronkowski and Aaron Hernandez. Ryan said on Friday that he hadn't been approached by Winslow about his role, which is the No. 2 tight end behind Jeff Cumberland. He was unsure, however, if Winslow had spoken to offensive coordinator Marty Mornhinweg. "We have to look at it this way: We have a really good tight end in Jeff Cumberland, and this is a guy who's a young stud tight end," Ryan said. "You look at him, he's a big guy, can block and he does a nice job receiving. He's a good player." Before the suspension was announced, Ryan was asked if he expected Winslow to remain with the team, and the coach answered simply, "Yes." Ryan was then asked if he thought Winslow might not want to remain with the team. "I think you'd have to ask him those types of questions," Ryan said. "What I can tell you about Kellen is he's done a tremendous job here and a guy, and I laughed about it, I said he's a warrior. He wasn't lying when he said that. We got the video out of it. But that's him: a great competitor. "That's what he's brought here." It is likely that tight end Zach Sudfeld, claimed off waivers from New England last week, will make his debut with the Jets on Sunday with Winslow out. Along with Cumberland, New York also has Konrad Reuland on the roster at the position. Since Winslow will be placed on the suspended list, the Jets will have an open spot on their 53-man roster. Winslow was offered a tryout by the Jets in minicamp in June, and signed him a few days later. The former Pro Bowl tight end had a terrific debut, catching a team-leading seven passes for 79 yards and a touchdown. He is only two years removed from catching 75 passes for Tampa Bay in 2011, but his surgically repaired right knee made him a low-risk, high-reward option for the Jets.